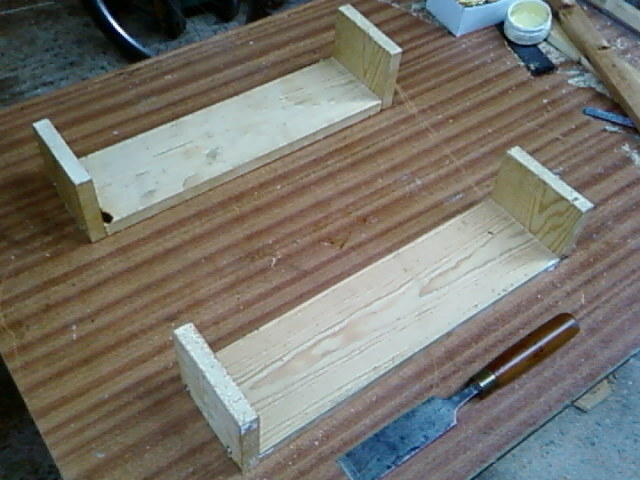 The jig comprises two simple boards with ends as shown. The only critical dimensions are the length of the board, which is the same length as the top bars (17" in my case) and its thickness, which is also the same as the thickness of the top bars (3/4" in my case). 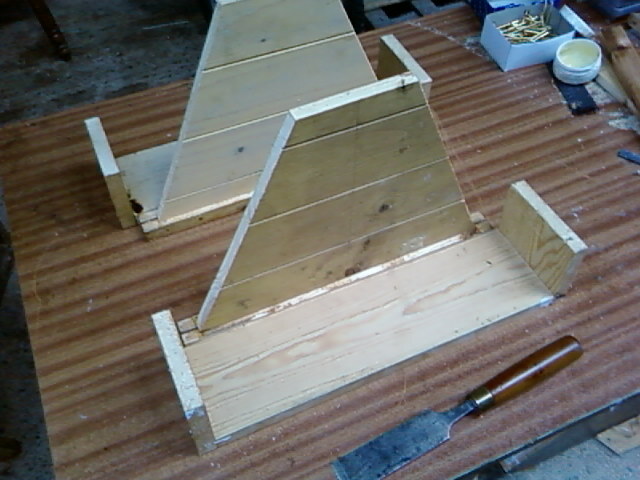 This shows the addition of two follower boards to act as guides for the sides, ensuring a good fit, as shown below. This is how it all fits together for drilling. 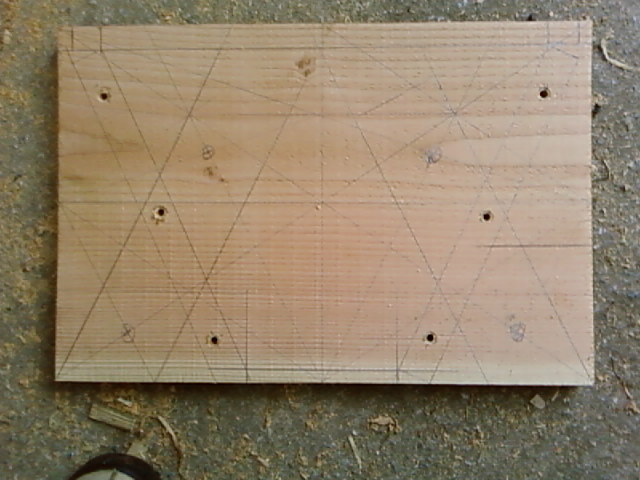 This is the other part of the jig, showing a drilling layout, ready to lay over the end boards so hole positions do not have to be guessed at. Sorry Phil, it's no good to me - I can't dance! Don't be silly; it's for predicting the mid-winter sunrise! Don't you worry, I'll bring in that midwinter sunrise! Oh, wait, that's for predicting the midwinter sunrise. Well, a jig is good. Wait a minute--isn't that the missing piece of the da Vinci code? Have you thought about getting together with a local woodworker and making these to order. With the jigs and all and using economies of scale, they could be turned out for a reasonable price with some profit. We know there is a market for them. Isn't it amazing how the simplest solutions always seem to take the longest to find? I have a couple of woodworkers who have expressed interest - we'll see! Our mill uses similar jigs when assembling top bar hives. They really help! Been away for a while, but I must have missed this post becos it wasn't that long ago. Excellent! Time to make some more TBH's. I have just constructed a TB hive from a kit of pieces of wood provided to me. Unfortunately it did not come with a jig or instructions. I had a tough job putting the sides and ends together accurately. I now find that one of the follower boards does not have a snug fit. There is a small gap, probably large enough for a bee to crawl though, for a couple of inches of its length near the top of the board. Is this going to be a problem ? Should I make another follower board that does fit the space snugly? Thanks Newwoman. Just to be clear, the small gap I have is between the side edge of the follower board and the side of the hive, not at the bottom. Are any bees likely to attempt to escape from central space into the end space? I can rest easy now ! What do you build for feeding? The one I bought had a opening for that. Now I am building my own and need some suggestions. You need my latest book - published on Monday! Very new to all this. Building my first TBH. 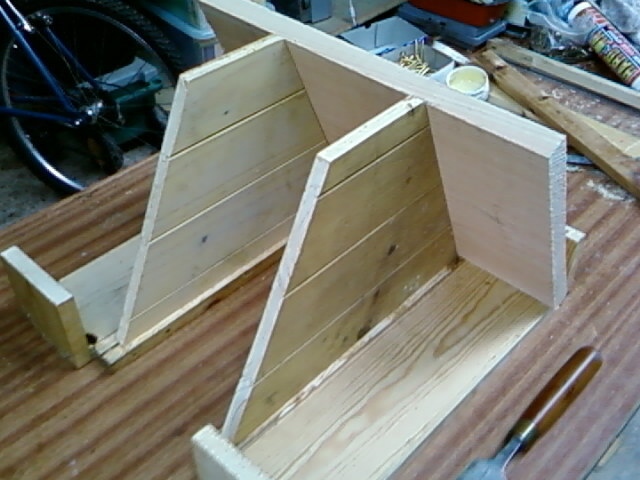 Built the "spreaders" and then cut the sides and ends and made sure they were square. I tend to do the more difficult things first, even though the instructions clearly state to make jigs to hold the sides first. Was getting ready to make those when, by chance, my eye noticed an "appliance mover" (large hand truck with a strap clamp) in the barn. Hmmm, put the spreaders in position, laid on the sides, and put the strap around and slowly tightened it. So far, so good, very easy to adjust things. This may cause the spreaders to be a tight fit when the ends are attached, however a little sanding will address that, as a snug fit is required? "Spreaders," may be the wrong term, separators or dividers perhaps? I have just built my first TBH body using Phil's instructions. 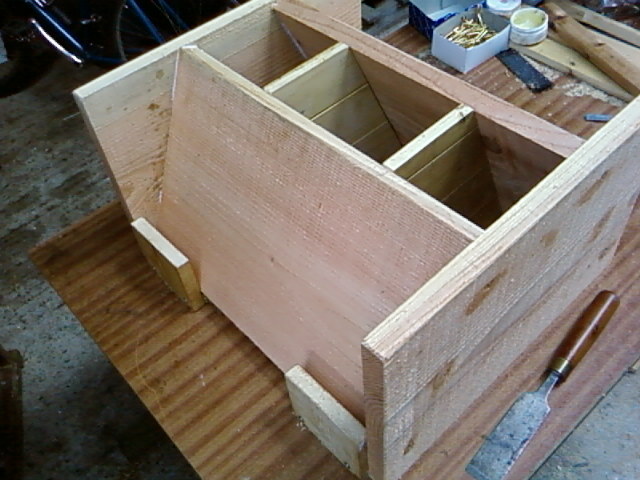 Making two jigs from scrap pine worked a treat and helped align things very well. My woodworking skills are very basic and the most difficult task was doweling and glueing the 15cm cedar planks together. My advice is to take your time, measure twice and cut once. I have used Phil's two books as well as the free plans off this site. Making a second one will be much easier. Are there any plans on the web for various roof designs? What is the best insulation to fit into the roof in winter? If you make your own hives, save the saw dust and shavings and place in an old pillow case. Warm and flexible. Sheep fleece is great if you can get it. Avoid anything that isn't permeable as moisture can find it's way up through smal gaps between the top-bars, condense and fall back onto the bees. I place a 35mm - or 50mm sheet of Kingspan or similar (edges sealed with tape) on top of the bars. Or old carpet underlay..
oh my oh my ! da vinci code drawings eeek ja ! yes yes the comment about having these hives made and flat packed so that they can be ordered pleases me enormously ! i will sleep on it again. having slowly come to think these dimensions are meaning PLANKS OF WOOD 4 inches wide to nail together somehow ! how do i nail planks together ? oh my oh my i cant get my head around this yet. You use wood glue and a clamp to glue three four inch planks together to form a single 12 inch plank. ah ok thx yes. i am not giving up ! i will master this ! eeek ! ouff ! daylight so back on the theme today ! Or if you're not confident about gluing & clamping, just use battens to join the planks, or short pieces of plank across the long pieces, and screw them together. hive cutting tool found ! safe ! easy ! light ! has jigsawblade, circular blade and sanding facility ! depth to 26mm ! plenty ! now to do ? HIVE OUT OF DISCARDED FENCING PANELS AND A DOOR LEFT IN CARPARK OF NEIGHBOUR WHO SAID I CAN TAKE THE WOOD ! jaja ! cost 55GBP from b and Q...cuts under doors ! this is light ! not heavy ! no risks of kickbacking at me and most of all i can hold it ! unlike a circular saw heavy monstrosity ! and i found wood glue...name...ouff...incredible hulk...ouff...gonzilla...aha GORILLA !